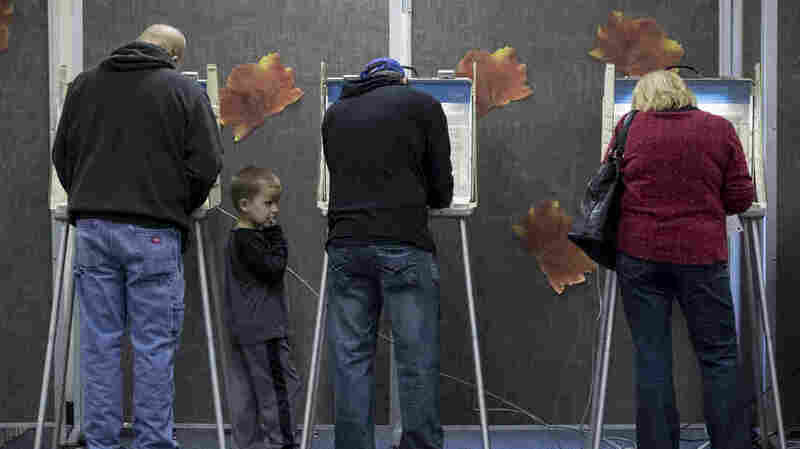 Voters Could Clamp Down On Ethics, Campaign Finance At The Ballot Box More than a dozen states have ballot measures aimed at putting stricter rules on candidates and officeholders. One activist says even Watergate didn't ignite such interest in enacting ethics rules. Voters in Missouri cast ballots on Election Day 2016. This year, it's one of many states where voters will decide on ballot measures aimed at stricter government ethics rules. The surge in ballot questions comes as national Democrats are embracing ethics reform issues. House Democrats have legislation ready to launch, with more than 100 Democratic congressional candidates signing a letter this month calling for reforms to be "the very first item Congress addresses" in January. And 120 Democratic nonincumbents on next week's ballots have pledged to reject contributions from corporate PACs. "It's telling that we have so many challengers for Congress that are running on this issue," said Larry Norden, deputy director of the democracy program at New York University's Brennan Center for Justice. "But to get real change now, the only way to do that is at the local and the state level." Some of the ballot measures would exceed federal standards, which have been steadily relaxed by the Supreme Court. Congress last passed a major campaign finance bill in 2001. One of this year's broadest measures is in South Dakota. Known as Amendment W, it's a rerun of 2016, when voters adopted major reforms — which the Legislature promptly rescinded. Proponents then drafted the current version as a constitutional amendment, Amendment W, which the Legislature cannot reverse. Among its provisions are restrictions on gifts from lobbyists to lawmakers, a ban on campaign contributions from foreign sources, reductions in special interest money and creation of a more independent ethics commission with greater enforcement powers. Amendment W drops a proposed system of publicly financing campaigns, which was the most controversial piece of the 2016 measure. A well-financed national group, RepresentUs, is pouring money and other support into South Dakota. It also backed the 2016 initiative. "What we do is we decide which are the states where there is a real possibility of impact, of victory, and protecting those victories post-passage," said RepresentUs Director Josh Silver. "When we see that combination, then we get in and support them with time and treasure." Leaders of the opposition in South Dakota say RepresentUs and its allies exaggerate both the problem and the proposed fixes. They contend Amendment W would give the ethics commission too much money and power. "I understand that people are concerned, and angry," said David Owen, president of the South Dakota Chamber of Commerce and Industry. But he added, "I think there's a growing sense that W is wrong, and we're trying to fan that flame with everything we've got." The pro-W effort is financed by RepresentUs, based in Massachusetts, and a Washington, D.C., PAC called End Citizens United. Disclosure reports show they spent about $200,000 this summer and fall, most of it raised from foundations and wealthy donors. Its biggest donor, former Microsoft executive Jon DeVaan, gave $50,000. The W Is Wrong campaign raised about $150,000 during the same period, mainly from South Dakota business and trade associations. It also got $25,000 from Americans For Prosperity, a politically active nonprofit in the Koch network. South Dakota may be debating one of the most wide-reaching ballot questions, but 18 other states are asking voters to deal with elections and politics issues. Colorado, Massachusetts, Missouri and North Dakota propose campaign finance reforms ranging from bans on foreign money in campaigns to restrictions on corporate and union money; in Denver, there is a proposal for public financing of local candidates. Tougher ethics rules are on the ballot in Florida, Missouri, New Mexico, North Dakota and South Dakota. Voters will decide on proposed ethics reforms, such as creating new ethics commissions, in states including the Dakotas and New Mexico. Long Beach, Calif., has proposals for municipal commissions on ethics and redistricting. And in Baltimore, voters will decide whether to have a citizens commission consider public funding for municipal candidates. Silver, at RepresentUs, said the interest in reform is stronger than in the years after the Watergate scandal, which is considered a high-water mark for good-government issues. "The reforms we're seeing across the country to elections and campaign finance and ethics are the most robust set of reforms we've ever seen in the history of the country," he said. The story originally identified End Citizens United as a superPAC. It is a PAC.